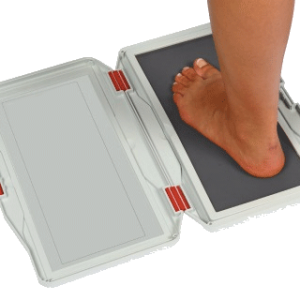 The main component of this foot pressure measuring platform is a quadratic field consisting of 4096 pressure sensors. The data from these sensors is transmitted via a wireless connection to the data modem attached to a computer. The pressure distribution of a static measurement or dynamic steps can be evaluated using two and three-dimensional display. The user interface for the pressure measuring platform is easy to use, intuitive and graphically the best in its field. The recorded pressure load can be evaluated in different modes; using the display of maximum or average foot pressure values as well as evaluating the movement of the centre of pressure. • Easy to learn: reduced complexity of the available options makes this product easy to learn and use. VCP8000 with 8000 pressure sensors, and VCP12000 with 12000 pressure sensors.